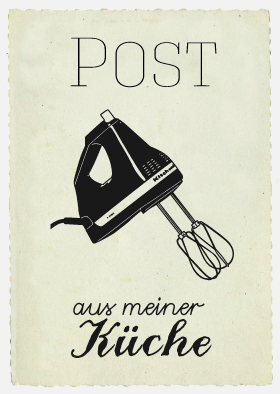 This week, we also took part in Post aus meiner Küche (Mail from my kitchen). This is a wonderful initiative from three lovely German ladies. You sign up for a round of exchange and you have to send your partner something to eat based on the given theme. In exchange, you receive something delicious from them. Past themes include: Let's Picnic, Very Berry & Chocolate. Of course, this round's theme was Weihnachtsschickerei. I am not sure how it would be best translated and I am not attempting it here (someone else?). But it basically a Christmas theme. I am not much of a cook. In our household, the man is the chef. But baking is a different ball game! 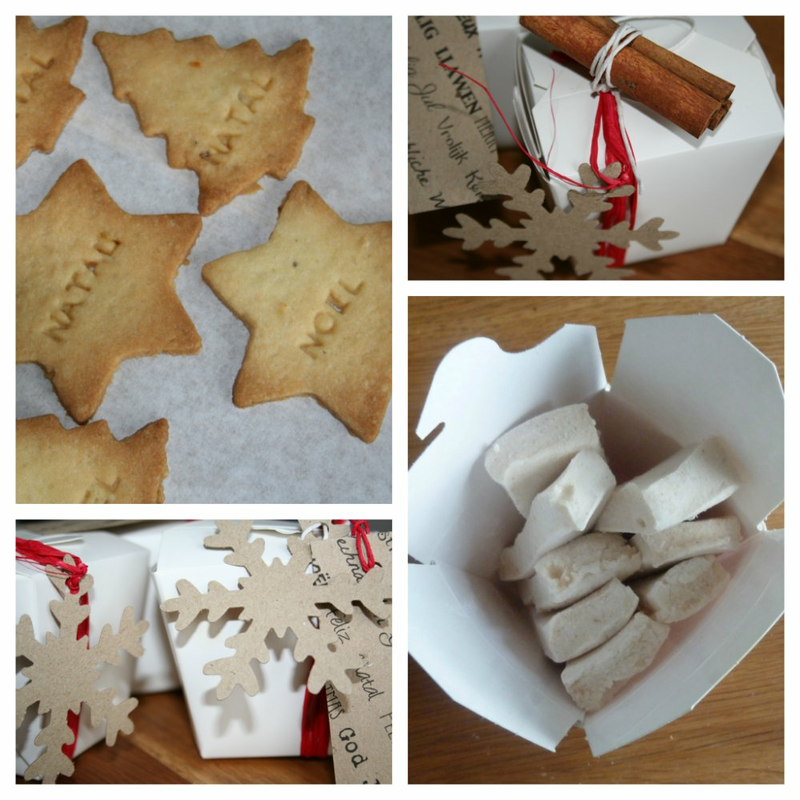 After much debating and armed with strict orders from my partner that she didn't like anything to do with coffee, we decided on Gingerbread Marshmallows and Cardamom and Clementine Biscuits. Christmas for us means spices. We love using them in our cooking (all year round). And the marshmallows have become a classic family recipe that goes round offices and friends houses at this time of year. I like to try different flavours every time! So, it was easy to pick really. We battled through child sickness but managed to get them out this week as promised. The two recipes are really easy and both should survive a trip in the post easily. Throw in some cute packaging and we hope our partner likes them! 1 heaped teaspoon of cinamonn, ginger and cloves each. Mix the corn flour and icing sugar. Oil your tray. (You need a deep tray about 30cmx20cm.) Pour the flour and sugar mixture in the tray until it is all coated. Remove and keep the excess. With a beater (I used my trusted KitchenAid), beat the egg whites until soft. Add 40g of caster sugar and keep beating until soft peaks. Boil the rest of the caster sugar with 20cl of water and the honey. Leave to cook for about 7 minutes. When this is done, remove from the heat, wait a couple of minutes until the mixture cools slightly (but don't let it go cold) and add the gelatin while mixing to dissolve it. Now the tricky part here, is to then pour this syrupy misture onto the egg whites. Do this very slowly while beating. Keep beating until the eggs have cooled (your arm will hurt if you have to do it by hand - I had to leave my mixer to beat for 10 minutes). Don't let the mixture harden. If you see it gets hard, stop. Pour into your tray and set in the fridge for a couple of hours. When completely set, remove from the fridge and cut into squares or any shape you like. Dip into the corn flour/icing sugar mixture to stop them from sticking. Split the cardamom pods and tip the seeds into a mortar, then grind to a powder with the pestle. 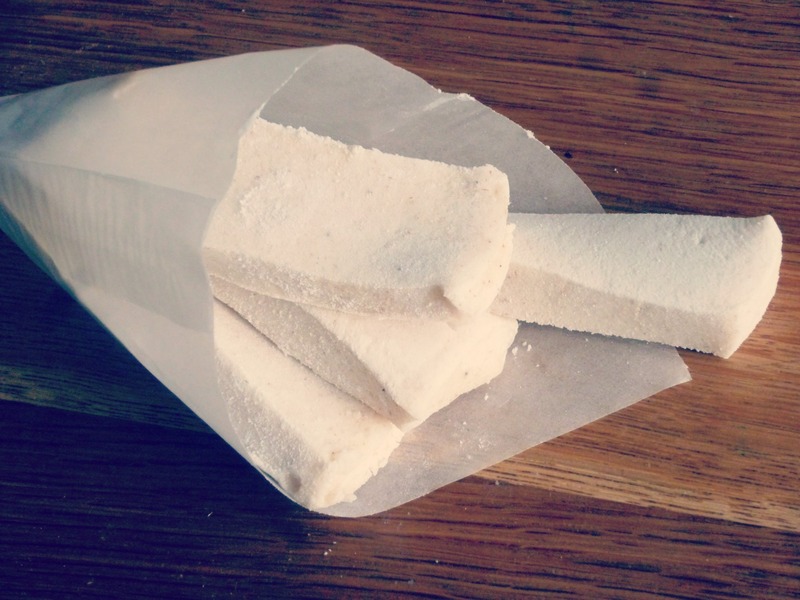 Tip the flour, rice flour and cardamom powder into a food processor. Chop the butter into small pieces and add to the food processor with the zest. Pulse to a fine breadcrumb texture. Add the icing sugar and mix briefly, then add the egg yolk and 1-2 tsp cold water and pulse to a firm dough. Wrap in cling film and chill for 15 mins. Heat oven to 180C/160C fan/gas 4. Line 2 baking sheets with baking parchment. Roll out half the dough at a time and stamp out the shape you want and transfer to the baking sheets. Gather up the trimmings and roll out again to make more biscuits. 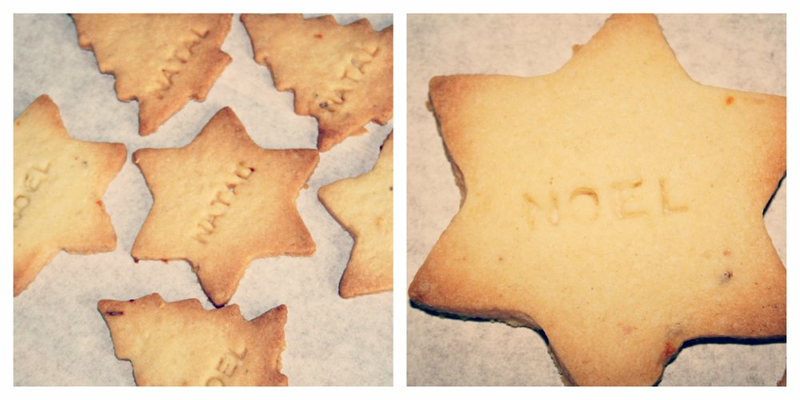 Here, I pressed a festive rubber stamp into the surface of each biscuit. Chill for 30 mins. You can also make a hole in the biscuits before baking them to then hang them as decorations. I am told they would last about a week on a Xmas tree.